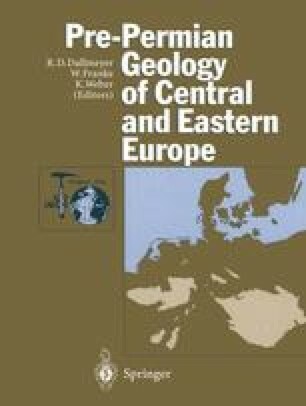 The external zone of the Variscan orogen in northern Europe can be traced from SW England via the Rhenish Massif to the Harz Mountains (a distance of ca. 1300 km) and then further into eastern Europe. Although Upper Paleozoic outcrops are discontinuous along the Rhenohercynian Zone, their common history is emphasized by similar sedimentary sequences, the nature of associated bimodal acid-basic volcanism and comparable tectonometamorphic events (Matthews 1977; Franke and Engel 1982; Holder and Leveridge 1986a; Franke 1989a). In broad terms, the sedimentary and volcanic history of the Rhenohercynia Zone records the formation of small late Silurian/early Devonian rift-generated basins that were progressively closed by plate convergence throughout the late Devonian to late Carboniferous (Behr et al. 1984; Franke 1989b). The presence of extensive submarine basaltic rocks testifies to periods of crustal extension, whereas the chemical characterization of their primary composition indicates that both mid-ocean ridge basalts (MORB) and within-plate basalts (WPB) are represented in the Rhenohercynian Zone (Herrmann and Wedepohl 1970; Floyd 1982a, 1984; Floyd et al. 1983; Wedephol et al. 1983; Grosser and Dorr 1986; Schmincke and Sunkel 1987; Platen et al. 1989; Platen 1991). These features imply that extension of the Paleozoic Mid-European continental plate was sufficient to generate some oceanic crust, of which the Lizard ophiolite is also representative (Bromely 1979; Kirby 1979; Holder and Leveridge 1986b). The Rhenohercynian Zone of northern Europe is thus envisaged as comprising ensialic basins (with WPB) that were sufficiently attentuated in their internal zones to produce a narrow segment of oceanic crust (with MORB).